As flexible working increases in popularity in workplaces nationwide, the number of people working from home is on the rise. Statistics show that working from home increases productivity, and even benefits your health, but it is so important to have a home office space that is comfortable and practical, to ensure that your work day is as efficient as possible. We have put together our top tips to creating a comfortable, professional and productive home office space. When deciding on the location of your home office space, try to consider noise and traffic factors; if you live on a busy road, you may hear constant traffic and noise from the street outside. You should also try to consider traffic in your home too!! If you plan to use your home office when the rest of your family is at home, or at times when you may have visitors, it would be wise to have your home office away from the kitchen or the main family living space. Mr and Mrs Tate's home office is on the ground floor of their family home, overlooking their serene garden and woodlands. Having such a tranquil view must be so lovely! Natural daylight is arguably the best available light there is, and making the most of it is vital in a productive home office space. Ensuring your home office has windows and allowing natural daylight to flood the room will also help ensure you have a good home and work life balance; your subconscious will help improve your productivity by ensuring your working day comes to an end when daylight is over! Burlanes bespoke home office furniture in Chelmsford, Essex. It is important to consider who will be using the home office space before the design process begins. If it will be occupied and used by just yourself, think about where in the room you would like to sit, what you would like your view to be, and how much space you would like around you. If your home office space will be occupied by more than one family member, or you even want a productive space for the children to do their homework, a dual desk space is ideal. 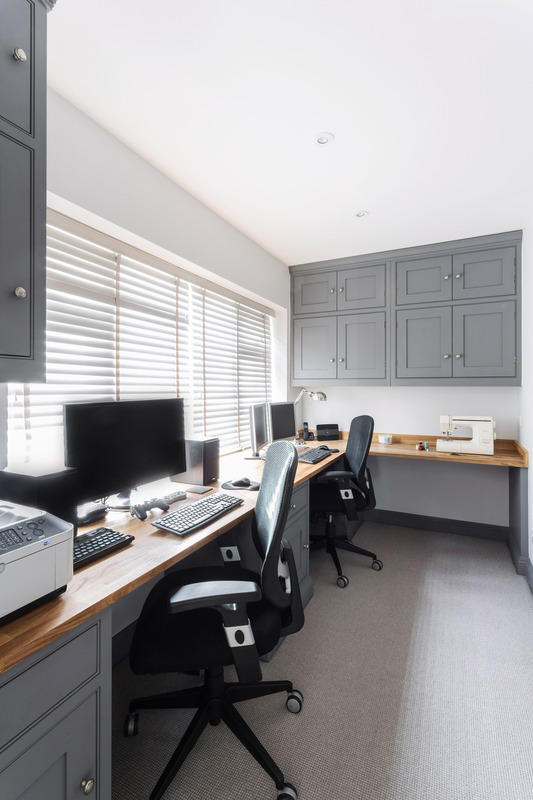 Burlanes bespoke home office furniture in Corringham, Essex, with dual desk space. Clutter is at its most distracting in a home office space, and you will want to ensure that the room is as tidy as possible, with all important documents within easy reach and access. 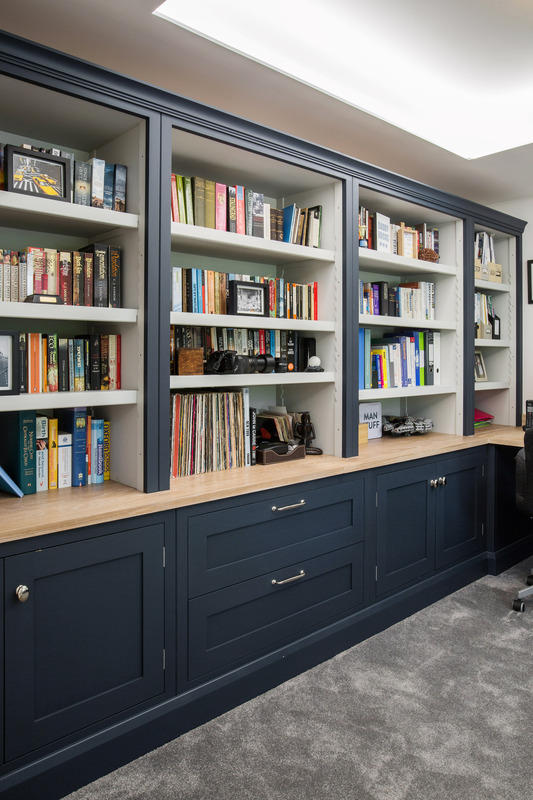 Bespoke home office furniture with made-to-measure shelving and storage solutions that are practical and functional will encourage you to keep everything neat and in order. As the old saying goes "A place for everything, and everything in its place." Burlanes handmade home office furniture, with full adjustable shelving, drawers and cupboards. It is incredibly important to create a space that you enjoy being in, and want to spend time in, when designing your home office. Work with a designer who will help plan the best layout for your working schedule, including positioning of devices such as the telephone and the printer. Adding your own personal touches such as photographs, inspirational quotes and memories is important too! 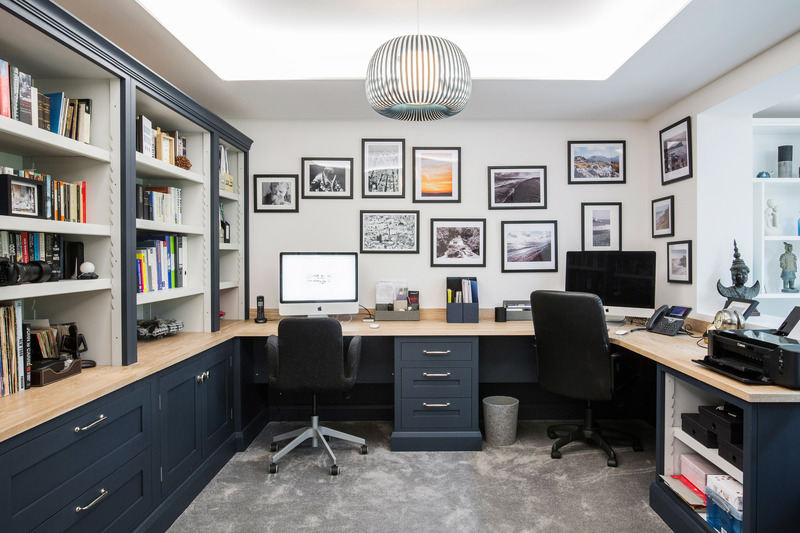 Mr & Mrs Adams have added photographs of their travels, family and favourite things to the wall in their Burlanes home office in Sevenoaks, Kent. 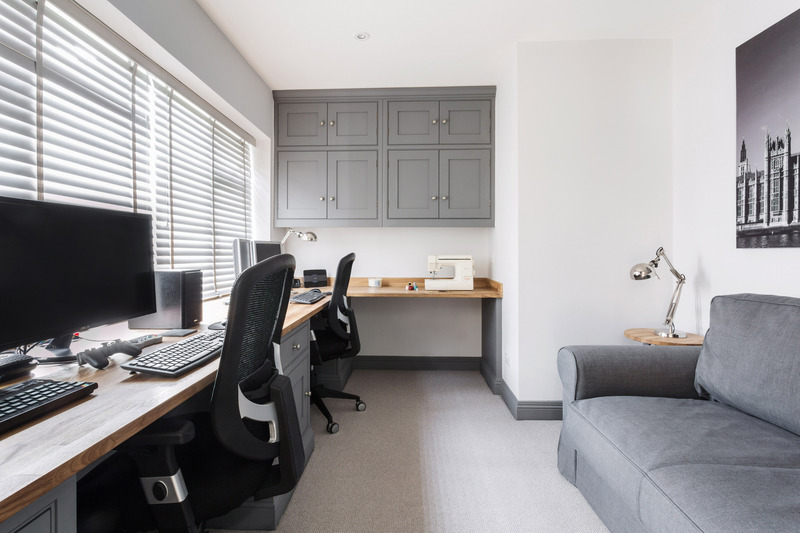 Whether your home office is a room of its own, or in a small space or living area, Burlanes' design team will ensure all of your needs are taken into consideration, and we will help create an organised storage space. Contact us to find out more about how we can design an office space perfect for your family home, or pop into one of our showrooms to see examples of our work.